Delhi Capital's Chris Morris is targeting KKR in their home ground. By virtue of the four-wicket win over struggling RCB in Bengaluru on Sunday, Delhi Capitals have moved up to the fifth position in the eight-team standings with six points from as many games. 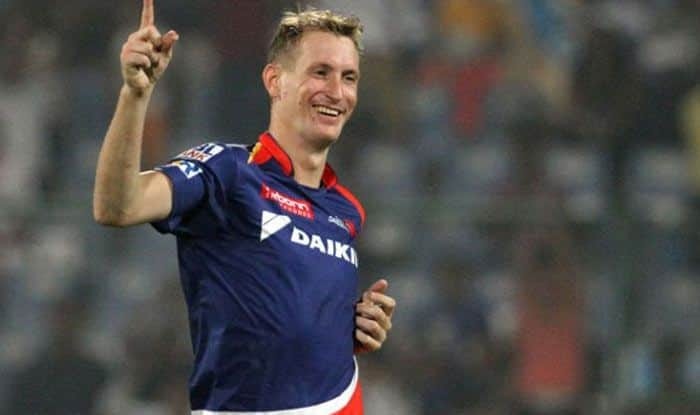 Their campaign back on track after the win over Royal Challengers Bangalore, Delhi Capitals are ready to upset table toppers Kolkata Knight Riders in their own den, said the team’s all-rounder Chris Morris. By virtue of the four-wicket win over struggling RCB in Bengaluru on Sunday, Delhi Capitals have moved up to the fifth position in the eight-team standings with six points from as many games. KKR is currently leading the chart with eight points out of four wins from five matches. Asked Morris about their next match, the South African said playing at the iconic Eden Gardens against the hosts would be a tough challenge. “KKR is playing some amazing cricket at the moment. They have some great match winners in their team, players with X-factor. We’ve got a few days in between to rest and recover, and to get our bodies strong and fresh,” he said. But it would be easier said than done as in their last outing against KKR at the Feroze Shah Kotla here, Delhi huffed and puffed to register victory in the Super Over. “We will, of course, go back to the drawing board and see what went wrong in the last match against them in Delhi which went to the Super Over. We will look to improve on those areas and make sure we are ready,” Morris said. Morris was happy with Delhi Capitals’ performance against RCB and said the victory on Sunday instilled confidence among the players. “It was a very pleasing performance from the boys yesterday. To go out and win against RCB was something the boys were preparing well towards. The performance throughout the whole game was great, and even though there was a slight hiccup towards the end of the game in our batting, it was very pleasing to register the win. Morris has taken six wickets with an economy rate of 7.93 in the four matches he played for Delhi Capitals so far in this tournament. Besides, he has also bowled a total of 36 dot balls, which has only been bettered by four other overseas players — Rashid Khan, Jofra Archer, Kagiso Rabada and Imran Tahir. “I think all the bowlers have been doing their respective jobs very well. I know that I have the responsibility of delivering for the team, especially in the middle overs and towards the end,” Morris said. “You will always face tough times during a long tournament like this, but having confidence in your own abilities is something that helps you get through that phase and come out on top.